I knew from the second that I learned of a proposed documentary that took a look behind Stanley Kubrick's 1980's classic The Shining, this was going straight to the top of my 2013 must see list. I'm a big Kubrick fan, but not just that, The Shining is one of my favorite movies ever. period. To this day despite multiple viewings, that film still manages to give me goosebumps. It's a truly nightmarish, relentless trip into madness. So much to my initial delight, I recently got the chance to sit down and watch filmmaker Rodney Ascher's documentary Room 237. When it was over, I couldn't help but think that this was so far removed from what I had hoped for. 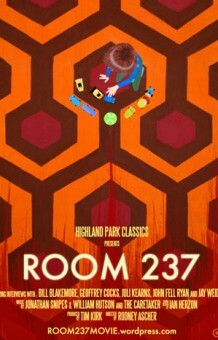 Room 237 is billed as a dissection into all of the hidden messages & symbols buried in Kubrick's film. Now that might sound swell & compelling, but let me tell you how it really is. A group of Kubrick enthusiasts, whom you never once psychically see on camera, share their wacky conspiracy theory's with you for 1 hr & 40 minutes. The End. Did you know the cans of talcum powder that are featured in the background scenes of the pantry at the Overlook Hotel, are connected to the slaughter of the American Indians? That is according to one person interviewed. Oh btw, Did you know that the typewriter that Jack uses is German? So that means The Shining is secretly about the Holocaust. So says another conspiracy theorist. If I may use an appropriate analogy, if Room 237 is the titanic, where it meets it's final nail..or let's say it's iceberg, is one "fan's" theory on how Kubrick faked the Apollo moon landing. I kid you not. Now I can certainly appreciate the time & effort that went into making this film, especially being a fan of the subject at hand. However it's final product is so incredibly clunky, it's never fully able to get past the point of complete and utter ridiculousness. Ascher uses unusual clips from random films to push the visual side of his story along. Kubrick's Eyes Wide Shut & 2001 are seen a few times, which is understandable. What threw me for a loop was the mass amount of footage used from Italian horror director Lamberto Bava's 80's gore-fest Demons. Apparently that is the only film in existence that features people in a movie theatre setting. Or perhaps Ascher is just a big fan. I'm all for an audience making up their own opinions on films, so just because I didn't care for Room 237, certainly does not mean that you will not find it interesting. Besides, if you do catch it and you find yourself gullible enough to believe in what you are hearing, please feel free to contact me. I have a story that connects the Easter Bunny & Hiroshima that I would love to sell you.